At Exxcel Gymnastics & Climbing, kids matter most. Exxcel kids love to learn in a nurturing and safe environment with caring, professional teachers committed to the development of confidence and self-esteem. We improve coordination and teach technique, but more importantly, we encourage a love of learning in our students and teach them to accept new challenges. Always understanding that it's OK to make mistakes, because mistakes can help us grow! Of course, we love gymnastics and climbing too, and we believe that involvement in sports is one of the best ways to instill healthy attitudes and values in young children for life. Kids learn to tumble and climb, but they also learn to respect others and appreciate their own self-worth. 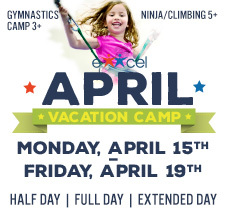 Exxcel Gymnastics & Climbing …Where KIDS matter most!